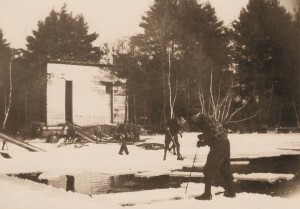 Read an excerpt from the book Paine Almanac on the Ice House. And if you would like the full book (169 pages) covering most of the camps around the lake and their history, contact Donal Drew at 262 Pequawket Trail, Standish, ME 04084 and phone at 207-756-4261. January, 1929. 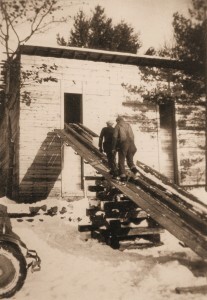 William and Byron Waterman on the ice slide, checking the progress of ice cakes as they were moved into the ice house.